The German Beer Purity Law (Reinheitsgebot) of 1516 stated that the only ingredients that could be used in beer production were water, barley, and hops. Note that yeast is not mentioned, it didn't arrive on the scene until 300 years later. To prevent price competition with bakers for the more valuable wheat and rye. Because once the idea of beer caught on unscrupulous brewers were adding ingredients such as tree bark, fish bladders, eggs and who knows what else to their beer. So in theory if the Reinheitsgebot was still adhered to today, and providing the supply of barley was pure, then people with wheat allergy or intolerance could drink any beer, unfortunately this though would still leave the celiacs out in the (beerless) cold. Sadly this isn't the case. Beer isn't just made from water, barley, and hops any more. It now has other ingredients, is often made from wheat, barley can usually no longer be guaranteed pure, and modern beers are often chock full of preservatives that will help make sure that your body will be better preserved than King Tut if you're dug up in a few millenia. What do they use to make gluten free beer if they can't use barley (or wheat)? 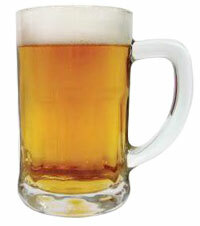 Generally gluten free beers are made with buckwheat, sorghum, millet or rice. (Note: buckwheat is a member of the rhubarb family, not related to wheat at all). There are also beers appearing on the market that have been brewed with barley, then using an enzymatic process the gluten is reduced to levels below the Gluten Codex of 20ppm. These are not "certified gluten free", but are "gluten reduced". Omission Beer, for example, has been given the Celiac Sprue Association's Recognition Seal of Approval as being risk free for celiacs. In recent years breweries have caught on to the fact that there was a very large beerless celiac market that had been left untapped. As a result some very good gluten free beers have appeared on the market, with the same alcohol content of their gluten containing cousins. Freshly brewed craft beer where all the beers not containing wheat are gluten reduced to less than 5ppm using an enzyme process. Note: they also brew gluten containing beers. Plus seasonal gluten free ales are available. Handcrafted beers from barley, hops, water and yeast, brewed using a proprietary process to remove gluten. Note: 11/19/2013 - Has been given the Celiac Sprue Association's Recognition Seal of Approval as being risk free for celiacs, after testing well below the new FDA standard for gluten presence of 20 ppm. Is Coors safe to drink on a wheat or gluten free diet? Is Guinness safe to drink on a wheat free diet?